(Lanka e News -10.Aug.2018, 11.30PM) The beginning of the end of the ‘Muttikasi mafia’ ( mafia after till money ) was clearly signaled day before yesterday (08) . 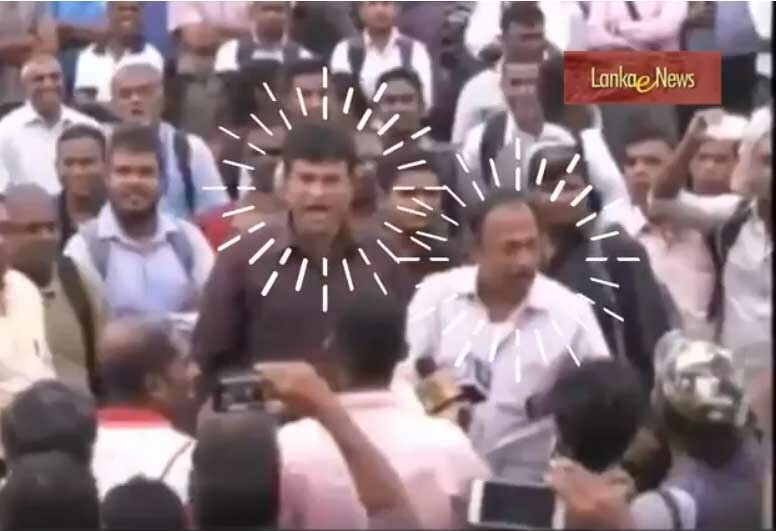 The leaders of the trade unions of the Railways who staged an unannounced strike were chased unrelentingly and attacked by the enraged public in the center of the Fort. The self centered self seeking leaders had to run helter skelter to save their dear lives. It is a well and widely known fact that a handful of extremist leftists of the ‘muttikasi mafia’ during the past three years have been deliberately sabotaging the victory won by the 6.2 Million people on 2015-01-08. These fake leftists and frauds had always been a thorn in the side of the government whenever it took any progressive measures for the good of the country , and a source of harassment and impediment to the people. The right of trade unions across the whole world is the right to bargain. It has therefore no right whatsoever to destroy Institutions or to persecute the public. However in SL , these ‘Muttikasi’ scoundrels who call themselves as trade unionists are totally ignorant of their true responsibilities. It is very unfortunate in SL these union leaders who should serve their membership honorably and honestly are instead serving as lackeys and lickspittles of politicos doing their sordid biddings, or are wheeler dealers looking for opportunities to put through a deal and make a fast buck. At least, the politicos however crooked and corrupt must necessarily face elections every five years , whereas these self seeking selfish scoundrels calling themselves trade union leaders are eternally entrenched in their positions. Some so called Left trade union leaders are much worse and retrogressive than the capitalist politicians . Otherwise will they oppose a most salutary policy to insure every child in schools ? What is more rudely shocking is , it is the teachers’ trade unions that opposed such benefits being conferred on students. It is a pity though they are teachers they do not know what their noble duties and responsibilities are . When they have to concern themselves with imparting knowledge to pupils ,they are instead worried about the insurance benefit the children are going to derive. What’s more ! Even they are interfering in trade agreements of the government and opposing them . It is therefore being widely questioned whether they are teachers or unscrupulous traders ? The worst Muttikkasi jokers are the doctors. The whole country is aware of how these doctor jokers alias draculas opposed even the ambulance service when that was introduced to the immense advantage of patients. Now these doctor jokers who have become pavement hawkers have developed a passion not for their profession but rather for the pavements staging strikes ad shouting slogans on pavements jeopardizing the lives of patients ,while their onerous duty under the sacred oath they have taken when being admitted to the noble profession after studying out of public funds is to serve the nation with utmost dedication and commitment. Lo and behold ! instead of that what they are solely and wholly obsessed with is filthy lucre (shooting up their private medical fees unconscionably sucking the blood of poor patients) however earned while at the same time, jeopardizing the lives of patients in state sector hospitals by staging ruthless strikes and wasting the precious official time on pavements despite collecting a salary from the government too. Now they are even trying to make it a habit to interfere in government’s agreements too which are not relevant or germane to their profession , and stage strikes against those agreements aimed at benefiting the country. It is a pity these doctor jokers even after their educational attainments haven’t the ability to think sanely and sensibly that those do not come within the province of their medical duties and responsibilities towards patients . The University students unions are no better. Their favorite occupation is striking and not studying. The worst part ? They stage strikes for everything except matters regarding studies when that should be their primary concern, and for which they have been admitted to Universities. Unbelievably SL is the only country in the world where there are student unions which mount opposition against groups of students who are spending their own money for their literary pursuits. These student unions are preoccupied with strikes only to obstruct the studies of those students and cause undue despair to the public. It is significant to note it is the masses who are driven into abysmal suffering owing to these meaningless ,senseless, heartless activities of these trade unions sabotaging every progressive plan, project and program of the government for the greater benefit of the whole nation . The reason for yesterday’s railway strike was not at all linked to their own rights and demands . The strike was based on the flimsy grounds that the salaries of another trade union group within the railways itself being brought on par with theirs. In other words the railway drivers wanted to continue with their separate union within the railways department. The monthly salary of the railway drivers exceeds Rs. 100,000.00 . The railways department which is a vital component of the public transport cannot be allowed to collapse due to irresponsible callous strikes. Besides , it is the prime and paramount duty of a responsible trade union to minimize the inconvenience caused to the public. The trade unions which are engaged in services towards the public ought to inform the public several weeks ahead of their date on which the strike will be staged . Whereas yesterday’s strike was staged suddenly without following those civilized norms. The trains after being brought and stationed at the metropolis at noon , the railway drivers went away causing undue hardships to the commuters who were waiting to travel, and the public . The government too was unaware of this abominable lightning strike. As the GCE adv. Level exam is on going these days , the evil motive of these muttikkasi mafia leaders behind this strike can be easily fathomed . Truly , honorable honest trade union activities in SL came to an end with the demise of the leader Bala Tampoe . Now the trade unions are headed mainly by uneducated unscrupulous rascals ,scoundrels and wheeler dealers who would sacrifice their own souls and the membership of their unions at the altar of selfish gains and self advancement of the trade union leaders . Such rascals and scoundrels being chased and thrashed by the public is nothing but absolutely fair and just. The public should not stop at this. In the best interests of the country they should take such action in the future too without relaxing or relenting for it is the right of every citizen to ensure that their democratic rights are not undermined by these self seeking opportunists and mafia gangs , let alone politicians .